Beautiful, gifted, and internationally known singer and actress Barbara McNair was born in Chicago, Illinois and raised in Racine, Wisconsin. Barbara began singing as a child and, after spending a year at UCLA, she relocated to New York City, working as a secretary for the National Foundation of Settlements while auditioning for countless Manhattan nightclub gigs. Impresario Max Gordon finally booked her at the legendary Village Vanguard, followed by appearances on The Arthur Godfrey Talent Scout Show and The Ed Sullivan Show. While performing at Las Vegas' Silver Slipper Casino, McNair came to the attention of famed newspaper columnist Walter Winchell, whose favorable reviews earned her a deal with Coral Records; her debut single, "Till There Was You," appeared in 1958, with the B-side, "Bobby," becoming a hit. That same year, she also made her Broadway debut in The Body Beautiful, later returning to the stage in The Pajama Game. Barbara recorded three more singles for Coral in 1958 -- "He's Got the Whole World in His Hands," "Indiscreet," and "Too Late This Spring," respectively -- followed in 1959 by "Goin' Steady With the Moon," "Lover's Prayer," and "Telephone Conversation," the latter a duet with Billy Williams. She also toured with Nat King Cole, appearing in his stage shows I'm with You and The Merry World of Nat King Cole. McNair then signed to the Signature label for three 1960 singles -- "He's a King," "All About Love," and "Kansas City" -- followed by a tenure at Roulette that yielded 1961's "That's All I Want From You," and the following year's "Honeymoonin.'" She landed at KC for "Cross Over the Bridge," and in 1963 made her film debut opposite Henry Fonda in Spencer's Mountain -- she also appeared in guest roles on a number of TV series, among them Dr. Kildare, I Spy, and Hogan's Heroes. After a 1965 effort for Warner Bros., "Wanted Me," later that same year Barbara signed to Motown, scoring her biggest hit with her label debut "You're Gonna Love My Baby." "Everything Is Good About You" and "My World Is Empty Without You" followed in 1966, as did sessions for "Baby a Go-Go," arguably her strongest disc to date -- remarkably, Motown head Berry Gordy rejected the single, however, and it went unreleased for decades, until bootleg copies earned rave reviews from the DJs and dancers populating Britain's Northern Soul club circuit. (Motown finally gave "Baby a Go-Go" a legitimate release on the 2002 compilation A Cellarful of Motown!) 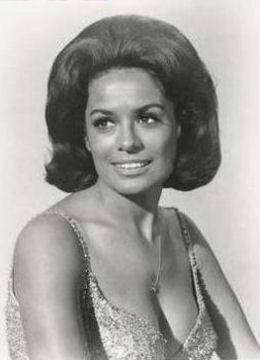 McNair's Motown run ended with a pair of 1968 singles, "Where Would I Be Without You" and "You Could Never Love Him"; from that point forward she directed more and more of her energies into her acting career, returning to the big screen in the crime drama If He Hollers, Let Him Go! followed in 1969 co-starring with a role in the Elvis Presley vehicle Change of Habit. Spencer's Mountain (1963) as the (uncredited) 'Graduation Ceremony Singer'. The syndicated variety series The Barbara McNair Show also premiered in 1969, running for three seasons and provided a powerhouse guestbook of friends like Tony Bennett, Sonny & Cher, and many others. Appearing on stage, in nightclubs and the occasional TV guest shot while taking time-out in 1976 to record one last single for TEC, "Because of You." In 1984, McNair accepted a recurring role on the daytime soap opera General Hospital, and in 1996 she returned to feature films. In addition to her own headlining nightclub dates, she also starred in Sophisticated Ladies, a stage tribute to the music of Duke Ellington. A Reel Cowboy to the end, Barbara passed away on February 4, 2007.